Now home to over 630,000 refugees, Ethiopia has become the largest refugee hosting country in Africa after Kenya. The ongoing conflict in South Sudan has recently driven thousands of people across the border, joining hundreds of thousands of Somali and Eritrean refugees already sheltering there. Whilst the recent relatively calm situation in Somalia has stabilised arrivals, the number of people seeking shelter from the oppressive regime in Eritrea has increased with up to 2,000 people a month fleeing into Ethiopia, many because of the open ended forced military conscription and accusations of gross human rights violations. This is putting a huge strain on the already delicate health care system in Ethiopia which only has one major public hospital capable of treating complex medical procedures. In February this year I visited Act for Peace partners to see how they are assisting refugees access health care in the capital Addis Ababa and the situation in Somali refugee camps along the border. Whilst each refugee camp has a clinic, there is generally only one doctor for the whole camp, usually housing over 10,000 people, so they can only provide the most basic primary health care, the more complex situations need to be referred to Addis. 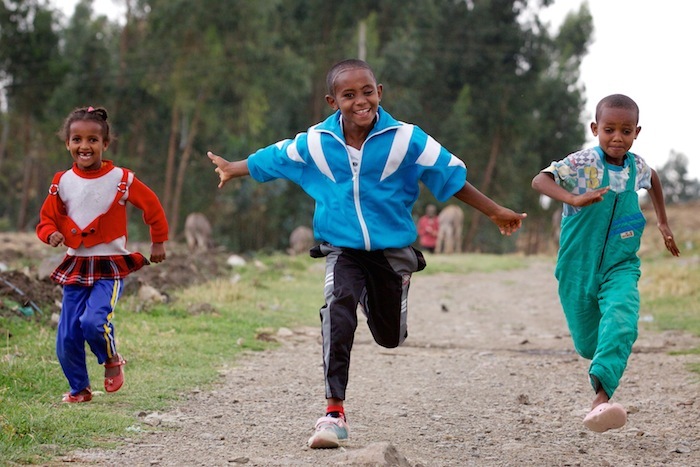 The Urban Refugee Program works with the government to help care for refugees and their families to survive in Addis whilst they access treatment by helping with medical expenses, emergency transport, supplementary dietary requirements and housing. Medical conditions range from conflict trauma to cancer and the need for kidney dialysis. On each assignment you always meet people who have an impact on you. Two such people here were Fred the ambulance driver and Tekeste whose energy and positivity is the reason why this assistance is so essential. 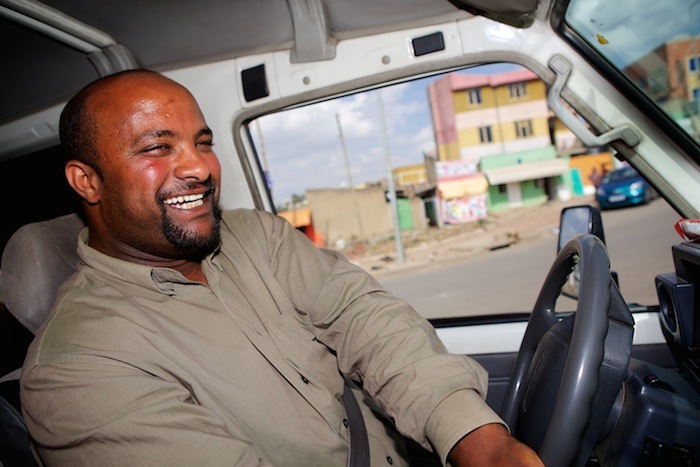 A good driver can make or break your story and I was lucky enough to be teamed up with Fred, a generous, calm and highly motivated Addis born ambulance driver who always went beyond what was expected of him. It was obvious he made strong bonds with the refugees who rely on him to transport them to their hospital appointments. He becomes like family to them and is quite often the only friend they have in the city. Spending hours driving along the choked roads of Addis, picking up refugees from the cheaper outlying suburbs, Fred would tell me stories of him helping refugees give birth in the back of his vehicle and how he would spend all night looking for a chemist that stocked the correct medication for one of his patients. 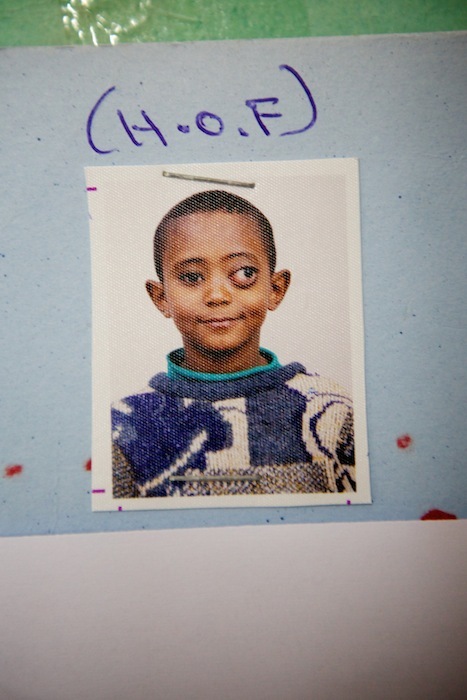 It was Fred who introduced me to Tekeste, the 10 year old Eritrean boy who without the intervention of the partner agency would have died from a tumour behind his eye. Despite showing obvious signs of major surgery, he had an infectious smile and energy about him that was inspiring. His story, as with all refugees, was troubling. 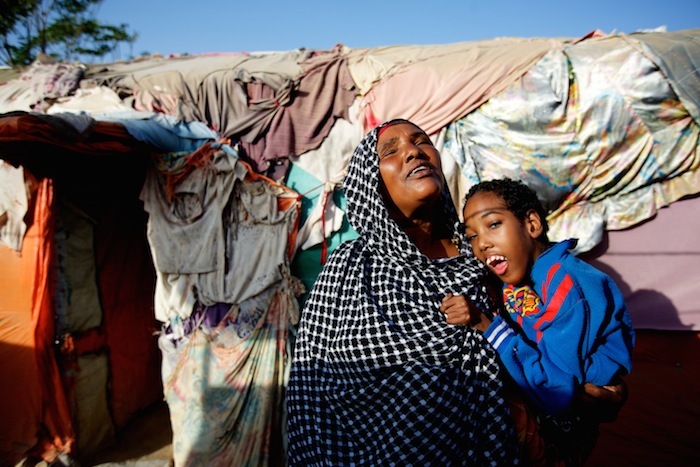 The family had fled Eritrea five years ago and had been living in a camp in the north of Ethiopia. Tekeste’s condition deteriorated and he was unable to see or walk around by himself. After the partners managed to get him a referral to Addis and surviving major surgery he is now back at school and playing with friends again. Doctors say his outlook is positive and he hopes to become a teacher one day. You can see and hear from both Fred and Tekeste in the video and stills below. If you’d like to contribute please click on the link here….. Refugee Medical Care in Ethiopia from Richard Wainwright on Vimeo. A young Somali refugee suffering from malnutrition in the Sheder refugee camp health centre in eastern Ethiopia on the border of Somalia. 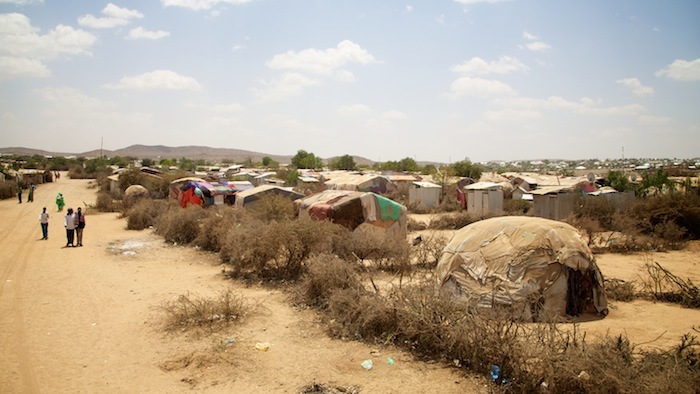 Sheder refugee camp is home to over 10,700 refugees and opened in 2008 following fighting in Somalia with Al-Shabab. More than 60% of the refugees are under 16 years old. 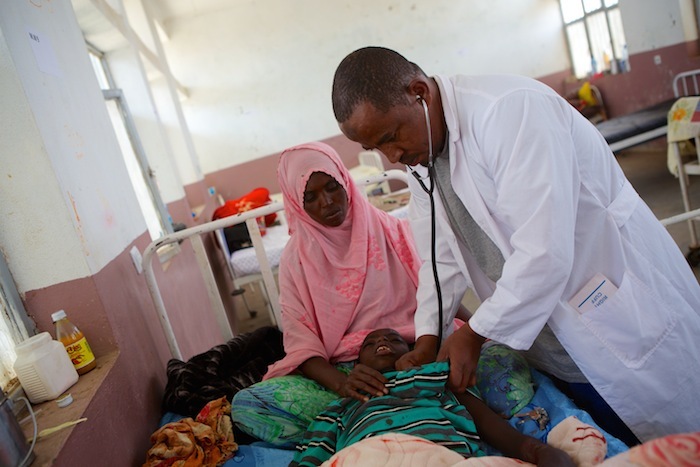 Senior Nurse Abdul Karim (35) looking after Somali refugee patients in the Sheder refugee camp health centre. There is only one doctor and a few nurses for all the refugees in the camp who often have complex medical issues from trauma wounds to physiological conditions. 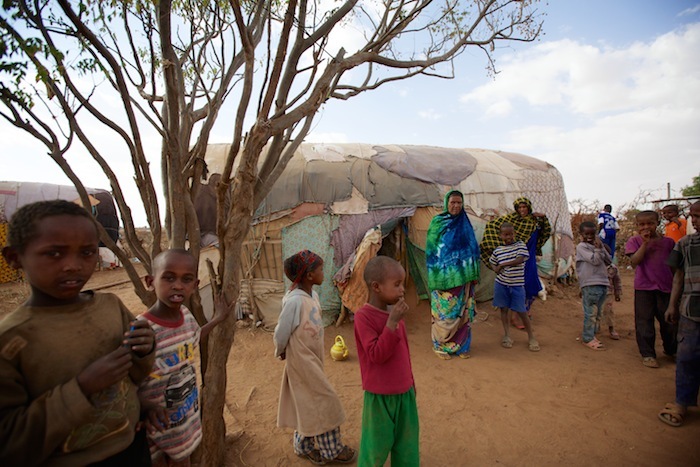 Ebode has 8 children and fled Mogadishu after fighting began 5 years ago. Her husband died in the fighting. She suffers from asthma, hypertension and has a cardiac condition. Medical staff at the Sheder refugee camp clinic say she is in need of permanent Urban Refugee Status so she can receive treatment at the Black Lion hospital which is the only public cardiac hospital in the country. 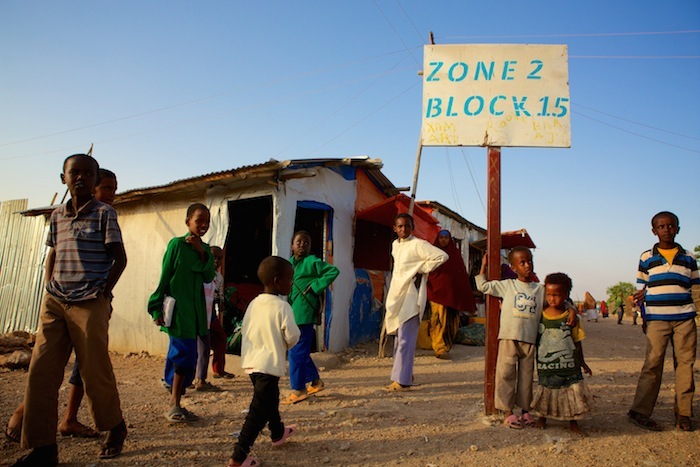 A street scene in Sheder refugee camp in eastern Ethiopia on the border of Somalia. There are over 250,000 refugees from Somalia seeking shelter in Ethiopia. Zahra (47) with her son Hussein (11) outside their shelter in Sheder refugee camp. 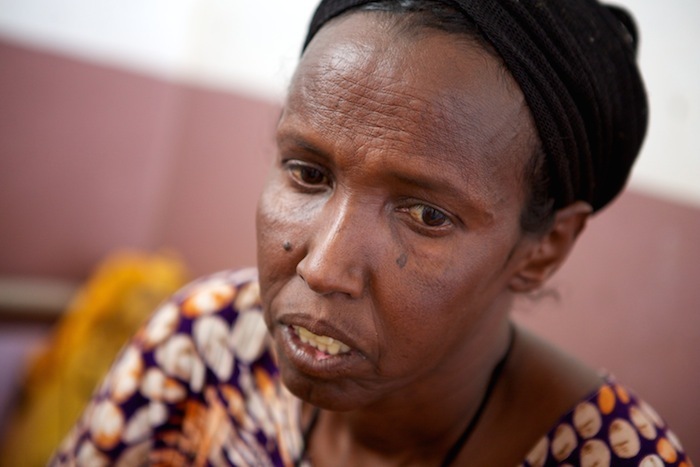 Zahra fled Mogadishu in March 2008 when fighting erupted between Al-Shabab and government forces. Her husband was killed and she lost track of her two other children at night during the chaos and has been unable to find them since. She was also injured and lost sight in one eye. She now tries to care for Hussein who has severe disabilities by herself and needs to be referred to the Urban Refugee program so they can receive the assistance and support that is needed. Somali refugees walk past shelters in Ar-barre refugee camp in eastern Ethiopia on the border of Somalia. 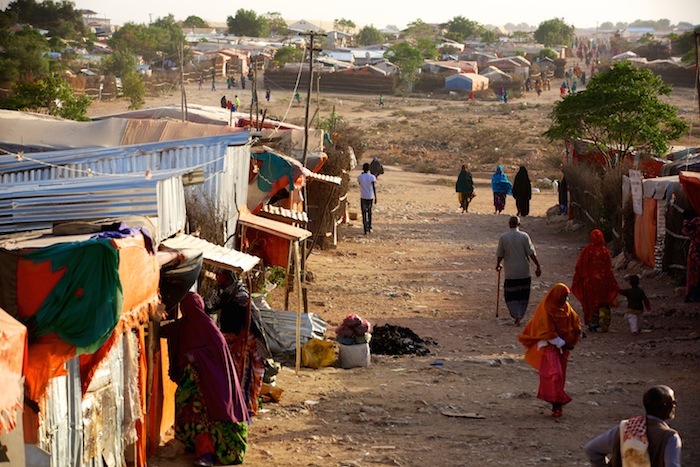 The camp is home to over 12,300 refugees and opened in 2007 following fighting in Somalia with Al-Shabab. 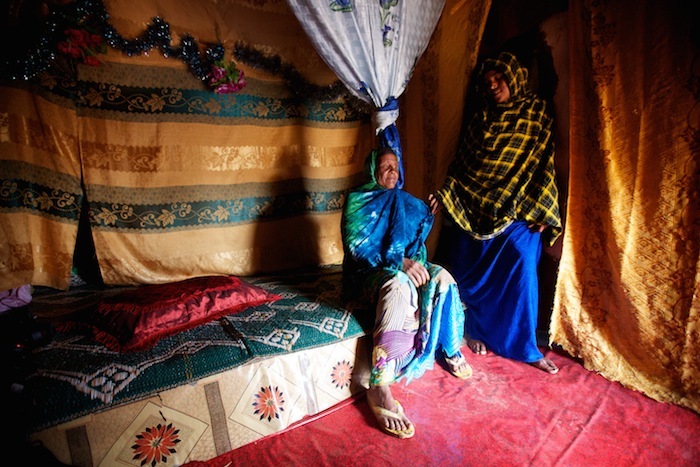 Ebado (60) with her daughter Halimo (20) in their shelter which has been home for the past 24 years in Kebribeyah refugee camp in eastern Ethiopia. The camp opened in 1991 following the breakdown of the government in Somalia which led to intense fighting. Children in Kebribeyah refugee camp in eastern Ethiopia, home to over 15,700 refugees from Somalia. Many children were born in the camp. 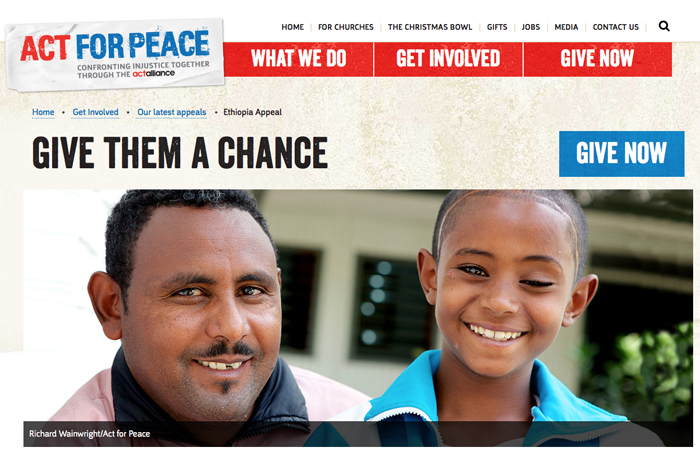 Fred has been an ambulance driver with Act for Peace partner DICAC for over 5 years. For many refugees, DICAC and staff like Fred are their only contact and support in Ethiopia. The long term patients build up strong bonds with the drivers and social workers. 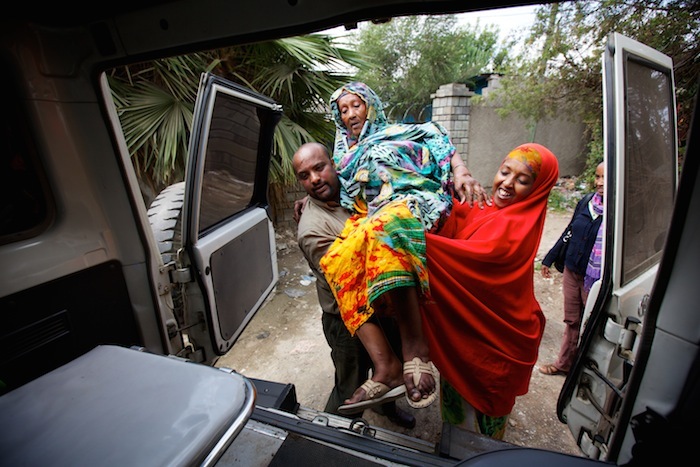 Fred helps Jamilah, an elderly Somali lady from her home in Addis into his ambulance to transport her to hospital for treatment with the help of her daughter. 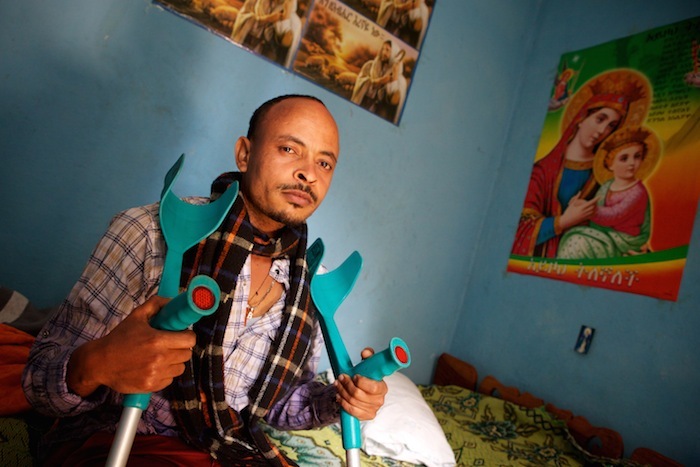 They spent 6 months in Aw Barre refugee camp before being medically referred to Addis for treatment. 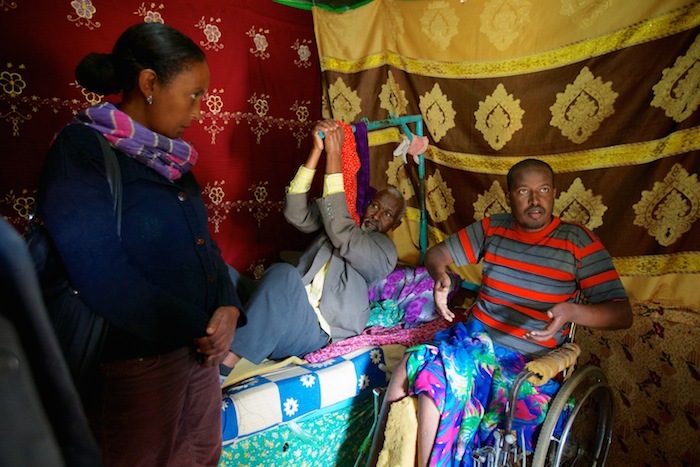 Social worker Abebech (37) discusses what further assistance is required for Khalif at his home in Addis. Khalif is a Somali refugee whose legs were paralysed after being shot in the back in Mogadishu. On the bed is Khalif's father demonstrating how his son gets out of bed. 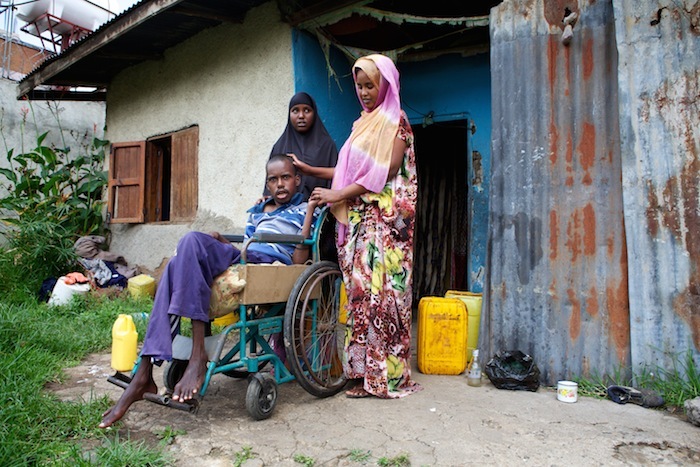 Sitting outside his home in Addis Ababa, Abdullahi (21) from Somalia has a degenerative nerve disorder and is now in a wheelchair and totally reliant on his sister (right) Medina (18) who is his primary caregiver and younger sister (left) Hamda (15). His younger brother Ahmed (19) has the same illness as did his sister who recently died. Medina missed out on school as one of the care givers but hopes to attend school one day. DICAC transports the brothers to hospital and pays for medication as well as rent/daily living allowances. 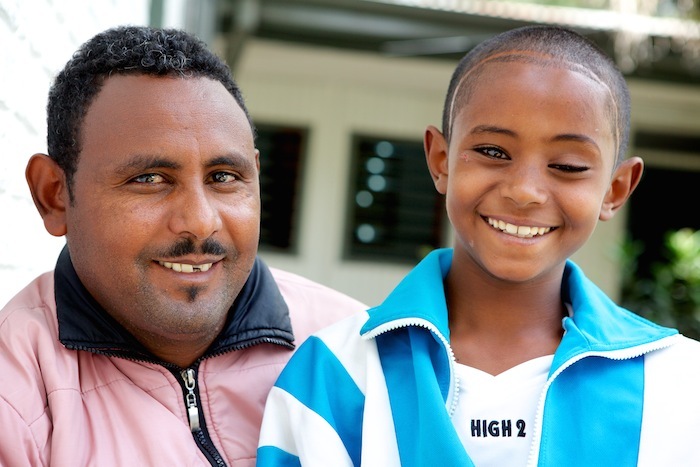 Tekeste (10) a refugee and DICAC medical referral patient from Eritrea with his father outside the main DICAC office in Addis Ababa. Tekeste had a tumor in his left eye which left untreated would have killed him. After fleeing Eritrea with his family, he spent 2 years in a refugee camp on the border of Eritrea. He has been in Addis on a medical referral for 5 years where he lives with his father. His mother is still in the camp looking after their 3 daughters. He occasionally gets to see her. Tekeste had a successful operation to remove the tumor in Black Lion Hospital and is still receiving rehabilitative treatment. He has lost the sight in his left eye but his right eye has regained full use. Before the operation, the tumor used to badly affect vision in both eyes. He is now able to go to school. Posted 6 October 2014 in All. .